Named for the fierce rip tides that come around the point of the Cape, this beach is the wilder ocean sister of Herring Cove. This portion of the Cape is building as a result of "long shore" transport of sand from the south, and Race Point has a vast sand beach. Provincetown has some of the most spectacular sand dunes on Cape Cod. Race Point Lighthouse, which marks the tip of the Cape for passing vessels, is a close walk. The shoreline at Race Point drops off dramatically- pass the day by watching the occasional whale or sailboat that comes through the deep water close inshore. Since it's on the Atlantic side, the water is colder with more surf. The undertow can be a bit strong but good swimmers should have no problems. Sun worshipers often prefer Race Point since it faces north and gets sun all day long. 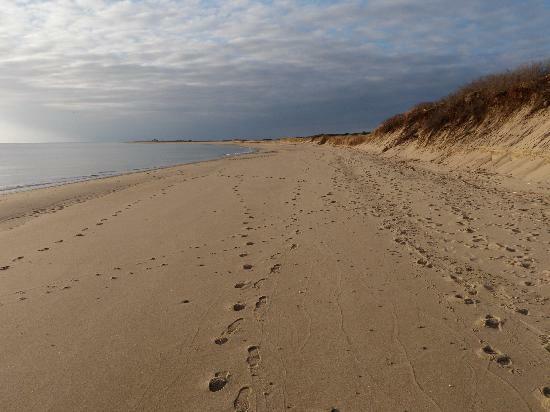 Race Point Beach is part of the Cape Cod National Seashore. Make a stop at the Province Lands Visitor's Center (on Race Point Road before the beach) and find out about the area and also the many summer activities offered by the Seashore. Seasonal Oversand vehicle permits can be purchased at Race Point Beach. There are various restrictions and all vehicles must be inspected before the permit is granted. SUVs with these permits can drive from Race Point all the way to High Head Beach in Truro. Parking costs $15 per day. Facilities include restrooms, lifeguards, and showers.